Last week, I wrote about Empire Avenue, the "social media exchange" that enables players to buy and sell virtual shares in another person or business or brand. With an expanding user base, the game helps players monitor their social influence and garner business-related connections that may lift sales and boost their bottom line. Ford (FORD) started trading at 25.35 eaves -- Empire Avenue's fake currency -- on its first day and ended the day at 45.61e. Today it trades at 102.77e. AT&T (ATT) started at 10.00e and ended its first day of trading at 37.76e. Today, it's trading at 108.70e. The representatives at Ford and AT&T say their companies spend less than an hour a day managing their Empire Avenue accounts. Ford's account is managed by Scott Monty, the company's global digital and multimedia communications manager. AT&T's account is managed by Christopher Baccus, the executive director of digital and social media. Don’t ‘game’ the system: “Acquiring investors and followers just so you can increase your brand’s share price isn’t a sustainable practice,” says Monty. 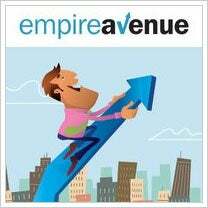 He suggests that more seasoned Empire Avenue players can sniff out inauthentic behavior quickly. They also aren’t shy about pointing it out. Don’t forget to reward: Think about giving something of tangible value to players who take the time to invest in and evangelize your brand. Aside from purchasing their shares, Ford's Monty recommends those with a brick and mortar or ecommerce operation should consider offering a discount code or coupon as a beneficial way of saying thanks. Monty also suggests profiling or featuring one investor each week by means of a "Shareholder Mail" message. This rewards a person for their exemplary support by encouraging other players to invest in that person. Do join communities: That’s why they’re called “communities.” AT&T’s Baccus says he responded to a player’s post about his company’s service, which drew a stunned response from the poster when he realized a company as large at AT&T replied to his query. This quickly established AT&T as a bona fide and trusted member of the community. Don’t opt out -- register your brand: As an aside, Randy Gage, author of Why You're Dumb, Sick & Broke...And How to Get Smart, Healthy & Rich!, says that even if you have no intention of ever putting your business or brand on Empire Avenue, you should still go to the site and secure your business or brand ticker before someone else does. Better safe than left out of the game, he says.